When you invest online, the stock trade commission is likely the fee you’ll pay the most often, so it’s wise to pay the most attention to it. But don’t think it’s the only fee online investors have to pay. Brokers often charge a host of other fees, which, depending on your circumstance, can add up fast. These extra fees are increasingly important for online investors to monitor as brokers’ trading commissions get more comparable. You should look for a page that discloses these fees. Maintenance fees: Some brokers charge monthly, quarterly, or annual fees just to have an account with them. Don’t pay maintenance fees. Period. If you’re paying them, you’re probably at the wrong broker. Most brokers exempt you from paying maintenance fees if you meet certain requirements. If you can’t meet them, switch to a different broker. Inactivity fees: Brokerages might charge inactivity fees if you don’t gin up enough commissions for the brokerage by trading. Don’t allow these fees to push you to buy and sell stock more than you’re comfortable with. Most brokerages that charge such fees offer exemptions for customers who meet other criteria. Transfer fees: Brokers charge transfer fees when you part ways. Expect to get nicked with a $50 or higher fee, which brokers charge supposedly to cover their cost of shipping all your stock holdings and transferring cash to your new broker. One way to avoid this charge is to sell all the stocks in the old account and then write a check to the new broker drawn on your old account. But this might not work. Keep in mind that you’ll incur commissions for every stock you sell, and tax considerations might cost you well over $50. 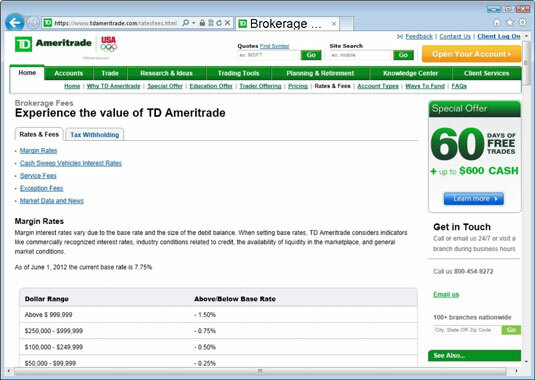 Some brokers, including Scottrade, don’t charge a transfer fee. And some brokers will pick up the transfer fee tab if you move the account to them. Certificate fees: Brokers charge you if you want the physical stock certificates you own mailed to you. It’s usually a $500 or higher charge. Some online brokers won’t help you get paper certificates at all. Check-writing fees: These fees range dramatically from broker to broker. Some charge you an annual fee to have the privilege to write checks against your account. Others give you a certain number of free checks and charge only if you write checks that bounce. Special orders: Brokers charge fees if you trade more than a set number of shares. Most brokers also charge extra for placing so-called limit orders. Margin fees: These fees are interest charges that result from borrowing money from the broker to buy investments with. Buying on margin is only for the most risk-ready investors.